As gamers, we sometimes place unfair expectations on new additions to a beloved series. Hopefulness and desire easily twist into biased reactions and unfair expectations. This, I believe, is especially true when innovation and divergence from tradition come into play. While every game in the Mana series should be thought of as an independent game, similar to the Final Fantasy entries, as fans of this series we can’t help ourselves in hoping for another Secret of Mana. However, sometimes a departure from the norm works well enough that we can appreciate a game’s uniqueness. Children of Mana is unique in that it both borrows from the past, yet possesses its own distinct style. 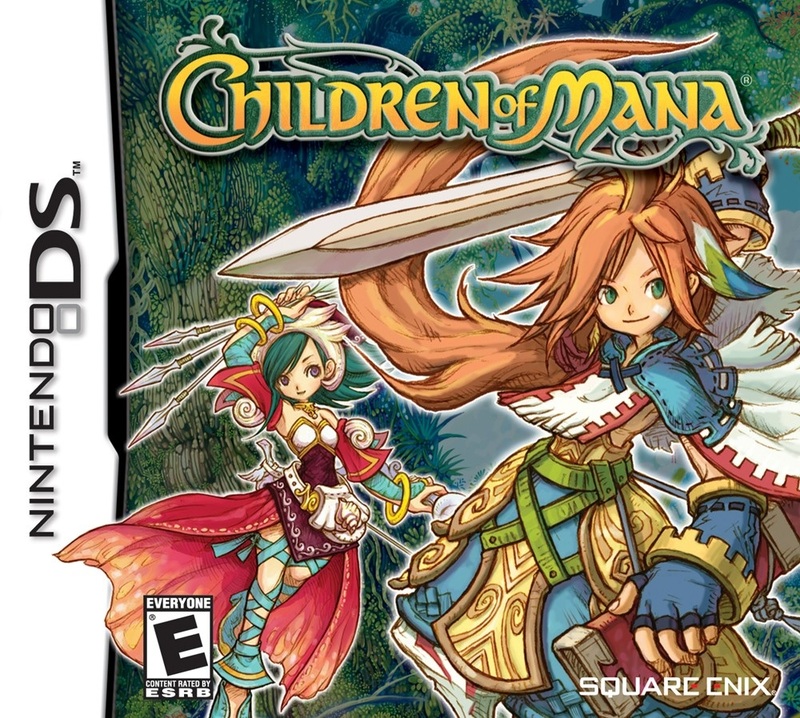 The sixth game in the Mana series, Children of Mana combines RPG elements and real-time combat with roguelike dungeon crawling, while also featuring those impressive aesthetics the series is known for. 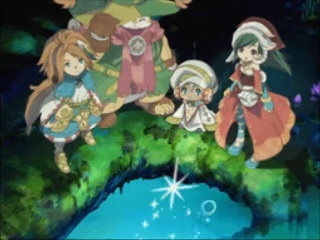 Children of Mana tells the story of four orphaned children who are destined to save the world of Mana…from Mana itself. Ten years prior, a cataclysmic event called the “Great Disaster” took place, plunging the world into chaos and causing much loss. Back then, two heroes emerged and ended the disaster. Now similar events are taking place as recent surges of Mana have fallen onto the world. Chosen by the Sword of Mana itself, it’s up to these four children to stop the Mana surges on each continent and unravel the mysteries behind their origin. 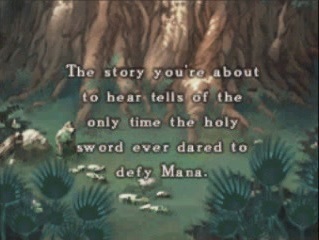 Although previous entries have had strong stories and impressive storytelling, Children of Mana lacks depth and detail. The initial plot is addressed through an intro cutscene and dialogue between your chosen character, the three unchosen, and the NPCs that inhabit the starting hub area of Illusia. All of this serves to provide some background information, as well as give you your first in-game tasks. As you progress, more of the main plot is filled in, but what is provided is hardly engaging or immersive. Details are sparse and what is given is inadequate to create a lasting, memorable story. Instead, the effort feels lackluster, somewhat predictable, and barebones. Character development is a slight improvement, as there are sequences and inner monologues that do convey individual personalities and feelings felt by the major characters. Outside of these major characters, though, the dialogue is bland and without any real emotion behind it. Also, there are insignificant differences in the response dialogue when NPCs speak to one chosen character versus another. While there are glimmers of quality, whether it’s a spark of genuine concern or a flash of emotion that displays deep friendship, these are too few and far between. They are lost in the underwhelming writing that plagues the game with a generic feeling and tone. It’s a shame, especially because those few glimmers of depth make a world of difference and left me wanting so much more. Despite the weak story, the gameplay of Children of Mana is stronger and fares far better. 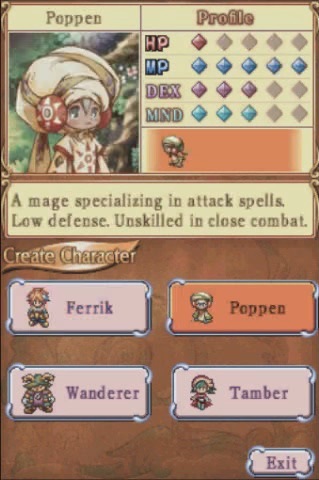 Unlike its series counterparts, Children of Mana is unique, as it combines RPG style combat, leveling, and quests with roguelike dungeon crawling. The main game advances as each major dungeon, or area, is cleared. Each area is made up of floors, or zones, and in order to proceed, an item called a Gleamdrop must be found and carried to a Gleamwell to advance to the next zone. Every quest requires the clearing of a number of zones to progress. Each area also has its own set of maps and layouts, which includes the positioning of Gleamdrops, Gleamwells, and breakables, but these are randomly assigned to every zone. This means that every journey through an area will be slightly different, as you never know which map or layout will be used per zone and seeing two identical zones is very rare. As for combat, there is both a melee and magical component to dispatching enemies. Regardless of the character you choose to play with, you start the game with a sword, and as the game progresses, a flail, bow, and hammer become available. Combat is real-time and each weapon has its advantages in a fight, as well as additional effects, such as destroying roadblocks or reflecting back attacks. Weapons are assigned to two buttons, but can be swapped via the ring menu. Along with these weapons, players can choose one of eight Elemental companions for magic attacks. Each elemental has a support effect and attack. By holding the B button, the Elemental is summoned on screen. Making contact with it will initiate the support effect and leaving it alone will initiate the attack effect. Elementals can be swapped out within Illusia. Children of Mana also features an equipment and gem system. New equipment raises stats, but may require a certain experience level to be used. Gems are accessories that can influence stats or abilities. They can add additional swings to weapons, increase stats, or prevent ailments like poison or paralysis. Overall, gameplay is mixed, in that there is fun to be had, but it also has the potential of becoming too repetitive or stale. The variation in combat from utilizing the four different weapons and gem enhancements is appreciated, and I also like the idea of earning the ability to use better gear as you raise your level. However, I was disappointed with the quests, as every main and sub quest relies on entering an area and advancing zones. Even the sub quests that are masked as retrieval of a person or item are still just a matter of clearing a specified number of zones in an area. The constant task of clearing zones wears thin fast and exposes the limits of combat. Quests are usually an opportunity to add depth to both story and gameplay, but they achieve neither here. Instead, they stretch combat thin and, worse, only reward you with cash or items that can be found within the areas anyway. I also didn’t care for how magic was implemented. Using magic is a far slower process here than other games and it doesn’t provide enough of an advantage to use consistently. I’ll admit there are plenty of moments in which magic is both vital and welcome in combat, but the execution is time consuming and tedious. As I mentioned before, you first need to summon the elemental and then either touch it or leave it alone for the desired action. 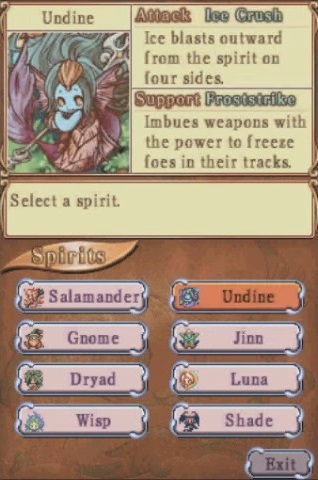 Previously, as in Sword of Mana, all you had to do was tap the button for a support effect and hold the button until the sprite appeared for attack magic. Here, both actions require holding a button, waiting for the sprite to appear, then either touching the sprite or waiting even more for the desired outcome. There was no reason to try and reinvent a mechanic that had been done correctly in the past. Finally, what I found disheartening was how your choice of hero is mostly irrelevant. While each of the four choices seem to have their pros and cons, it ultimately doesn’t matter, as the differences in damage dealt and received is insignificant. Acquiring newer gear and gems further obscures any distinctiveness between characters. It was an opportunity to allow for four different styles of play, but instead it’s just one that is poorly disguised. Fortunately, gameplay has a saving grace: multiplayer. Multiplayer allows for an additional three players to join you and play together. Similar to the multiplayer in Secret of Mana, you and your friends can complete any and all sub and main quests together, including boss battles. So, anytime the game gets too difficult or if you’re getting bored playing alone, you can have up to three friends (four total players) wreak havoc on-screen. There are some drawbacks, however, as only the player assigned as “Player 1” will keep any story progression. The other three players will be able to keep their experience and items, but their save files will not reflect the story progression. Nonetheless, you can always take turns being Player 1 and help each other progress through the game. The one downside is, of course, the need for your friends to also own game cartridges. 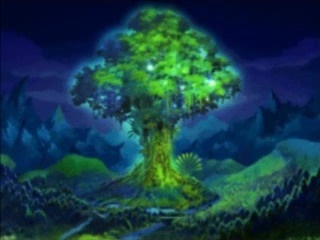 Even though the gameplay has its missteps and the story leaves me craving more, the one aspect Children of Mana possesses that I find truly outstanding is its aesthetics. This game is visually stunning and sounds equally fantastic. Visually, the game features gorgeous backdrops and highly detailed portraits that bring a vividness to the game. Much of the desired emotion I wanted from the story can be found in these portraits, as all of the main characters express their feelings through these pictures. The cutscenes, although short and too few, are equally stunning with the amount of detail, color, and animation they feature. The DS hardware limits are a nonissue, as the artistry is both striking and remarkable. The soundtrack is as impressive as the visuals, managing to capture the world in sound. Each track fits its fantastical location and story driven event superbly and provides an additional element of life to the experience. My only complaints are that the tracks are a bit short and there aren’t enough of them. With the amount of time spent in particular areas, these shortcomings become apparent. Having longer melodies or more variety within areas could have alleviated this, but my complaints surely stem from my desire for more of the brilliance that is already there. Aesthetically, Children of Mana is incredibly strong and manages to liven this fantasy world into something that looks and sounds amazing. 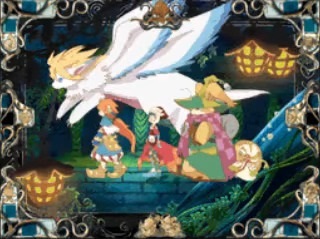 Overall, I found Children of Mana to be worthwhile, especially if you’re a fan of the series. The main campaign can be completed in about ten hours; it takes longer with sub quests. Since they’re not required, I recommend completing only the ones given by major NPCs. This way, the game’s best can be savored while avoiding much of the repetition. While it may not play or feel like other Mana games, it certainly has its own charms, and if you can tolerate its faults and keep an open mind, Children of Mana will provide a satisfying and enjoyable adventure.